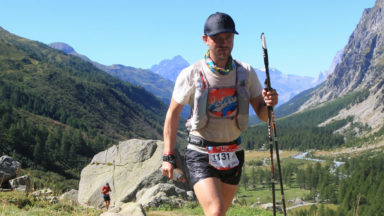 Have you run the Ultra Trail du Mont Blanc (UTMB)? Did you find it too easy? Do you wish you could challenge yourself a bit more? Well, legendary runner and five-times UTMB champion Lizzy Hawker has created just the thing for you! 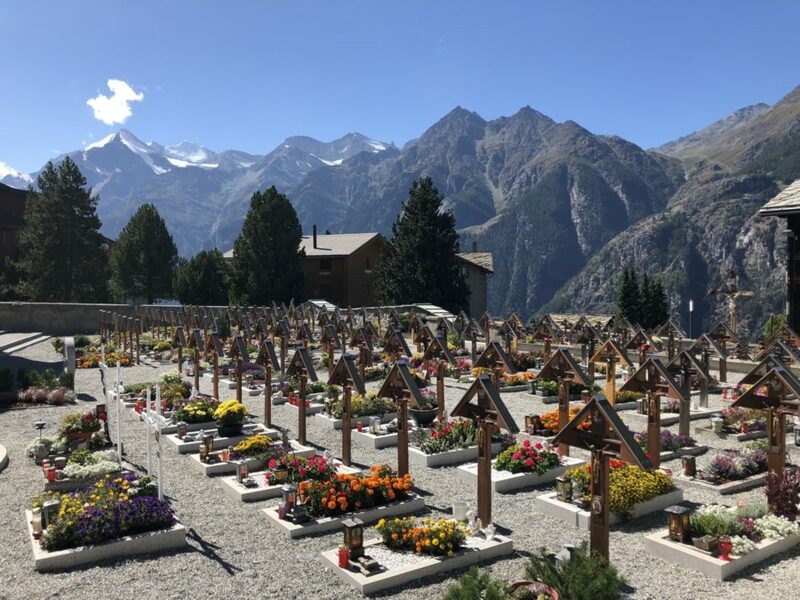 With an extra 1500m ascent and terrain that should have no place on a 100-mile trail race, the Ultra Tour Monte Rosa is the hardest race no-one’s heard about. In early September Cicerone’s Joe Williams gave it a go. It’s 3am, it’s 110km/68 miles in and I am still following the 100-year-old military mule track up the 2738m Colle del Thurlo (Thurlo Pass). I’ve been on this climb for two hours already and the end is nowhere in sight. Every time I catch a glimpse of the peaks silhouetted against the sparkling night sky, I think I’m close to the top. But this happy feeling is dashed as soon as I round a corner and spot the faint headlamp of the runner ahead of me, way, way up above. Thankfully, the angle of the path is not severe like it typically has been on this route; the paved slabs allow a good walking stride. This is a 1600m-long ascent; not even one of the longest of the race (there are two monstrous 1700m climbs). My entire existence has closed in on this climb… up, up, still up. As my cheap Casio watch clicks past the hour, I tuck my poles under my arm and fish out a waffle from my pack’s side pocket. It is stiff and cold, nearly frozen in the night air. This will be the 22nd waffle I’ve eaten so far (with the 22nd Tracker bar coming up in 30 minutes’ time), and it will not be the last. I chew it down; unappetising, but my stomach absorbs it. At least I can rely on my stomach to perform well. This is more than can be said for the rest of me. My legs have had no climbing power since the first climb; the long ascents at first were miserable. Why am I so weak? But after 16 hours, 79km/49 miles and meeting Caroline and Maddy (my phenomenal Italian crew) in Gressoney, I have accepted it. Now, my slow climbing pace is not a problem – slow and steady, you’re a tortoise – and I am more peaceful. My feet are as you might expect at this point in the race: a few blisters and some maceration, but holding together. They simply hurt. The insect bite I received on the back of my knee just 13 minutes after the race started (yesterday, by this point) still itches, but there’s nothing to do about it. But why complain? Complaining at mile 68 of a 105-mile race can do no good whatsoever! So I return my attention to the eating, the drinking, the motivational self-talk – keep chipping away, fastest minimum velocity – and wondering about when the f*** this climb will come to an end. I have been planning for this race for many months. The logistics are in place for the crew. They know where to drive, where to sleep and where to meet me. The food supplies are all bagged up. I have my clothing and equipment pared down to the effective minimum. My training, although not impressive or high mileage, has at least been consistent. I have practiced extensively with my planned clothing, equipment and nutrition. Equally important, I have worked hard at the psychological preparation. I know it will hurt. I know there will come a point where I have to overcome the desire to walk when my quads are screaming at me. I know there will be problems and that I’ll have to solve them on my own. I know I will have to fight the desperate desire to sleep. I have been building my psychological ‘fortress’ for weeks, strengthening its walls and stockpiling it with weapons and ammunition. 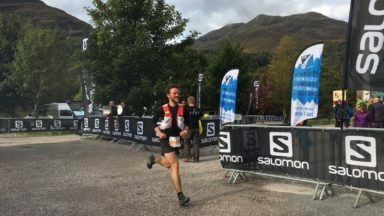 Under the advice of my coach Paul Tierney, this has been a deliberate act of mental preparation, not just hoping that I’ll be ‘tough enough’ on the day. Arriving in Grächen (race HQ) five days before the race allowed Caroline and I to get in some gentle acclimatisation by climbing the Allalinhorn (4027m). It was great to walk slowly up the peak, enjoy the climbing partnership and the Britannia Hutte, and forget about the race for a moment. Then, after a couple of days of resting, it was time to pick up my bib number and have my equipment checked by the race organisation. 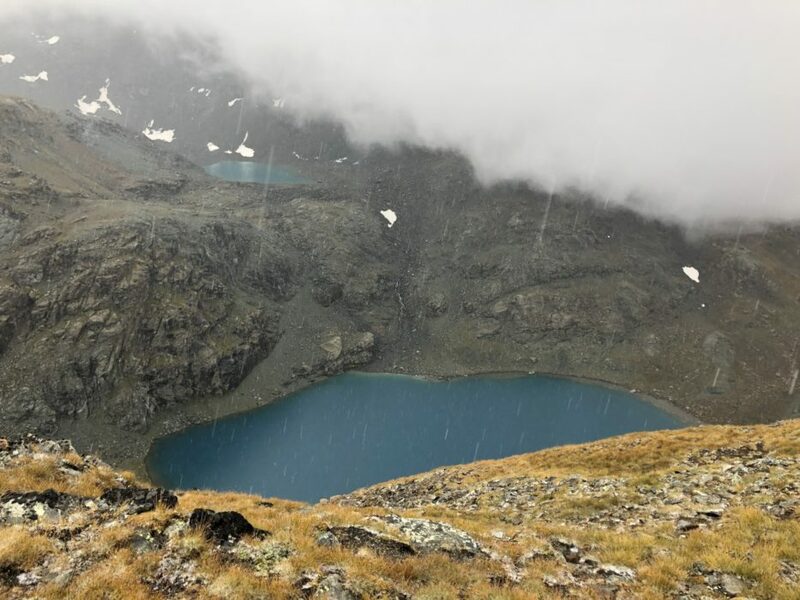 With significant relief, the top of the Colle del Thurlo finally comes. The military track slips through a narrow crack in the ridge and begins to descend. I now have a simple 1500m descent to Macugnaga (or Maconcagua as it became known) where I will see Caroline and Maddy for breakfast and start the second day’s running. 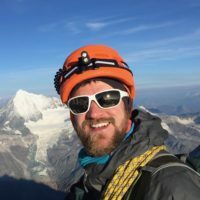 On this descent I have in my mind two conflicting pieces of advice: my dad described it to me with little in the way of flattery, whereas Fastpacking author Lily Dyu had assured me I’d love it. Well, as it turned out, I didn’t love it. Not one bit! The gently angled paved slabs are fine to run on at first, but as I lose height, they become more and more slippery as the surrounding vegetation encroaches. Then the angle steepens and the stones become lethal. After skating around for a long time, I finally resign myself to just walking after I catapult myself off into the bushes head-first (thankfully without harm). The Nike Wildhorse shoes I’m wearing, although protective and comfortable for the long haul, have diabolical grip on wet rock. I curse the soldiers from 100 years ago for their mule track, until it finally comes to an end 5km outside Macugnaga. Furthermore, I have to stop during this descent to – how should I put this – attend to some chafing issues. It has been a long night and I’m very much looking forward to seeing my supporters. I’m welcomed into the Macugnaga aid station by two volunteers and Caroline and Maddy. There are no other runners to be seen. I grab some wet wipes, Bodyglide, fresh clothes and head to the toilet to change. Returning, I wolf down some soup while Maddy attends to my feet. I have four blisters that she cleans and tapes carefully. Caroline tells me that I’m doing well and that there aren’t many runners ahead of me. At 125km/77 miles, we are now at the business end of the race, but ahead of me is an absolute beast of a climb: the infamous Monte Moro Pass, with 1700m of ascent. And off I go, onto the last major climb of a race that has been characterised by major climbs. There have been 2000m descents, too. And tiny trails steeper than I had dared to train for. There have been streams to ford, mud to splatter through, rockfall to keep an eye out for and glaciers to cross. There has been heat, driving wind, snow, hail and heavy rain. But there have also been glorious descents, epic views of 4000m peaks and the Matterhorn to run underneath. There has been wonderful camaraderie between the runners (all highly experienced and competent). And then there was the overwhelming sight that greeted me at the top of the Passo dei Salati in the middle of the night: millions of shimmering lights 100km away – Milan and the vast plains of northern Italy. As the hillside rises up towards the pass I calculate that I’ve been on the go for 28 hours. I also begin to sense that my mind is beginning to slip towards the subconscious and dreaming. 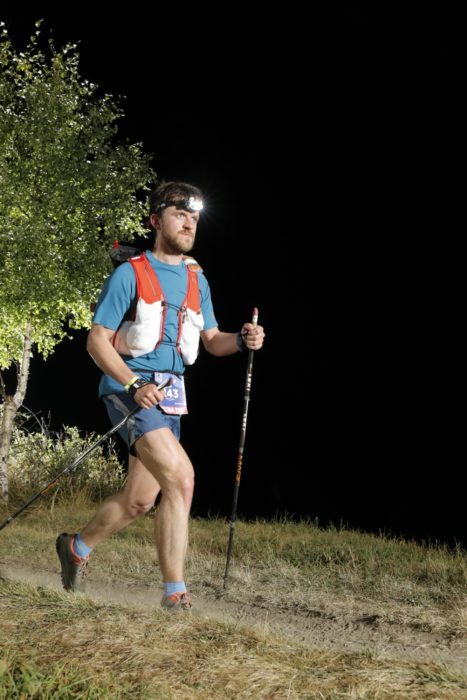 Like the UTMB two years ago, there are no hallucinations, instead it’s an invasion of the subconscious. I am certain that another runner is right behind me; as long as they are behind me they have some kind of mystical Monte Moro power. Taking a sip of coke alleviates the strangeness for a while and I battle upwards. My comfortable refrain, slow and steady, has lost its power and the climb takes 2 hours and 45 minutes to surmount. 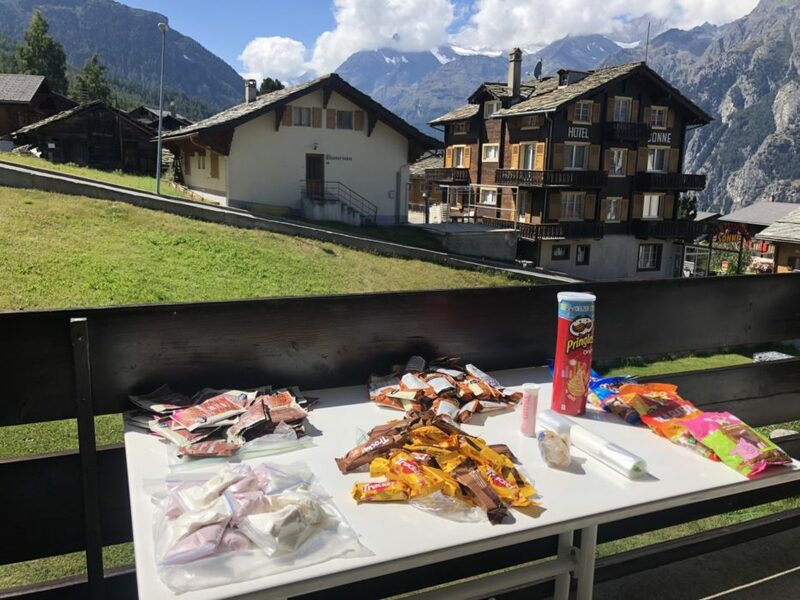 The rifugio below the pass itself is a welcoming bliss of warmth, food and kind-hearted and helpful volunteers (this aid station was staffed by the team from On Running, one of the event’s sponsors). Knowing I had to press on, I hurriedly left the cabin and tackled the final few metres up to the astonishing golden Madonna, which crowns the summit of the pass. When studying the maps and profile before the race, I had identified the following section as being crucial. Here is where I would summon my reserves and give it everything until the end. 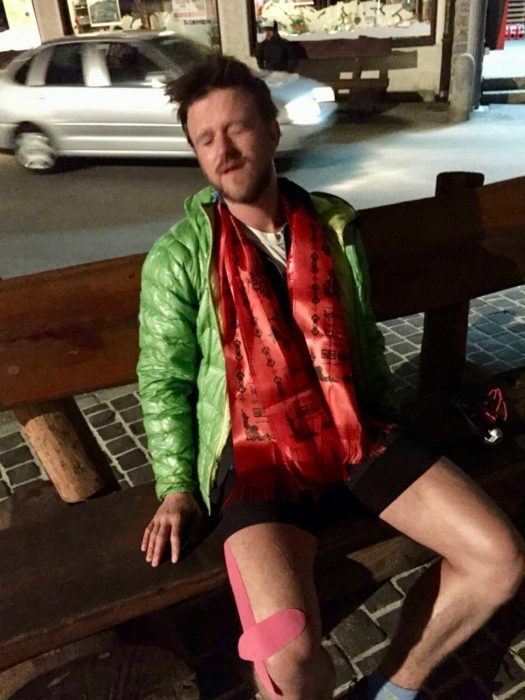 The terrain is theoretically runnable until Saas Fee (the 149km/92 mile point), so I am determined to try to run. But it’s far easier said than done. At this point, almost everything in my body hurts, and hurts even more when running rather than walking. There’s no point in listing the muscles or joints that hurt; it would be quicker to list the body parts that don’t hurt! So I make an agreement with myself that I will alternate running and fast walking. Each time I break into a run I start counting to 60 paces. At around 20 paces the desire to switch to walking is almost overwhelming, but I force myself to continue until a minute is up. So much for fast running through to the end! Then, at 138km/85 miles, as I begin to descend a section of steep trail, I feel a shooting pain in my right knee. Using it to lower down onto my left leg is painful. Taking a medium-to-large step up with the right leg is painful. Running is painful. Flat, non-technical walking is ok. I keep pushing for a while, hoping that it will go away. But after about 30 minutes I have to accept that the knee is ruined for the rest of the race. It will be a walk to the finish. 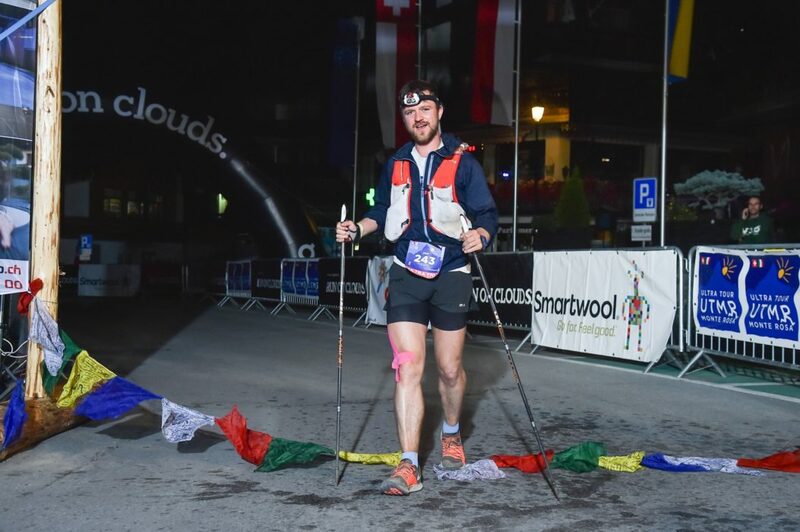 And not an easy walk, either; my dad had warned me that the 20km/13 mile section from Saas Fee (the aid station I’m approaching) to Hannigalp (the final aid station, 3km before the finish) contains some of the steepest, roughest and most dangerous terrain of the whole race. 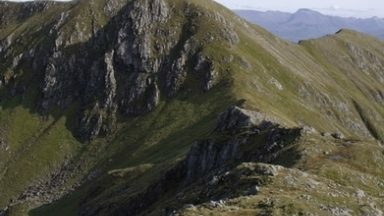 It also includes over 1500m of ascent. Knowing this, I am flip-flopping between two choices: quit or continue. As my brain debates the merits of each option, I still make sure I look after myself, so I attend to a blister, and keep eating and drinking. 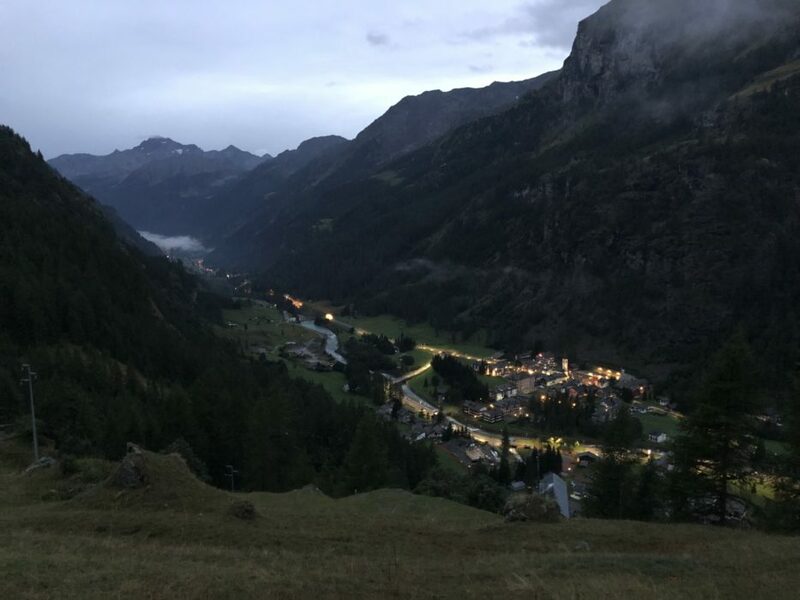 As I near Saas Fee, I have been walking for what feels like hours. And still no runner has come past me! I get my phone out to try to communicate my woes to my family; agh, no service. I know they will see on the GPS tracker that I have slowed down. I know they might be worried. I trail off, lacking the cognitive function to form a comeback argument. Damn, I’ve blown my chance of dropping out! 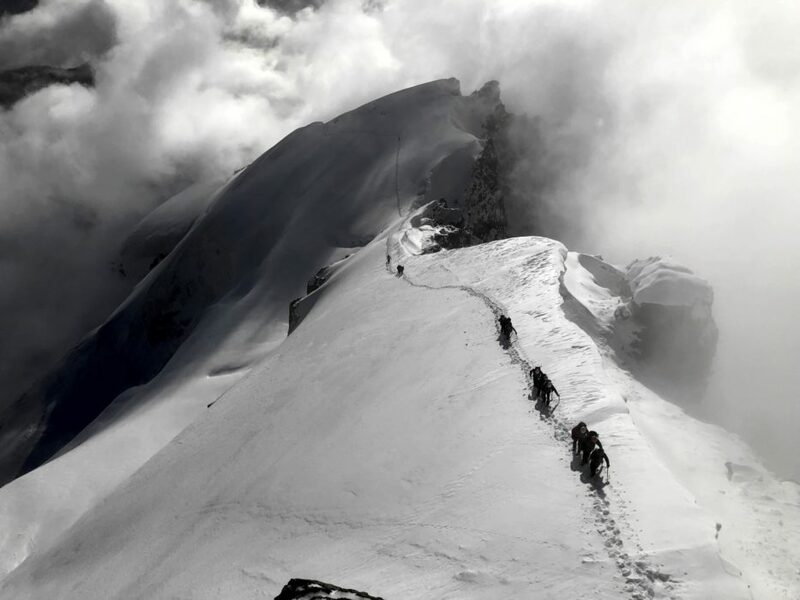 On the final stretch before reaching the aid station I had decided that I would clearly present the problem to my crew and they would make the decision as to whether I should drop out or keep going. I not-so-secretly hoped that they would ask me to stop for health reasons and I would be spared the final agonising miles. But I knew deeper down that there wasn’t anything actually stopping me from continuing. Yes, the knee hurt and I had to adapt each step to account for it, but I could still make progress, albeit very slowly. It might take many hours but I could get to the finish line. At the Saas Fee aid station, it is all hands on deck. 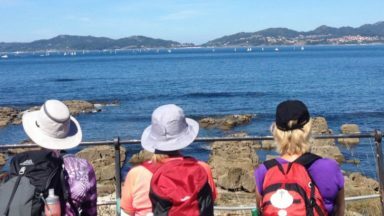 A first aider works on my blistered feet, Caroline repacks my bag with enough food for a long trudge to the finish, Maddy reapplies suncream to my arms and legs, and my parents attend to the dozens of other jobs that needed doing. I feel terrible, but perhaps now accept the fact that I can finish, even if it takes me many hours and into the second night. 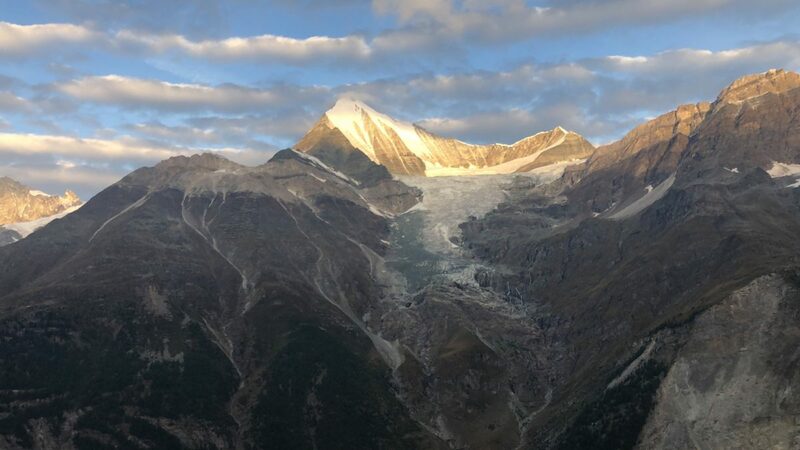 The shadows are lengthening and the glaciers of the surrounding peaks are beginning to turn pink. It’s a very beautiful alpine evening. 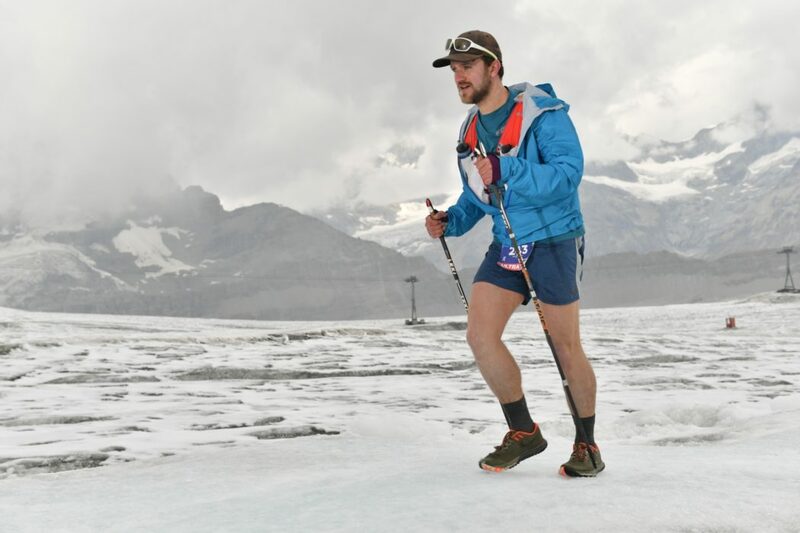 I begin to hope that I am past the worst of the terrain and that the Hannigalp aid station will come into sight soon. The previous five hours have been more of a psychological battle than a physical one. Thankfully, on this section, there are no places to drop out, no easy shortcuts down onto a road to get a lift back to the finish. 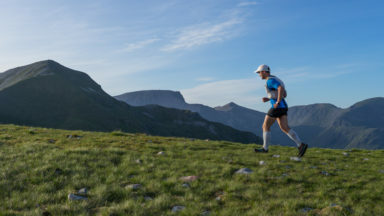 The only option is to press on across the never-ending succession of valleys and ridges, the constant 20m steep uphills and the subsequent 20m steep downhills. The necessity of walking is deeply frustrating. Every hour or so another runner passes me with ease. But I have shut off any competitive instinct in lieu of the goal of just finishing. In a way, it is nice to be passed by others; for a 10-hour stretch earlier on this second day I had seen no other runners whatsoever. I had almost forgotten that I was even in a race! My brain is going strange again, too. I wonder what it would be like if I imagine faces among the rocks of the path; without much encouragement I’m able to visualise scary, evil faces in the dirt. Don’t do that Joe. No good to come of that. I snap out of it by taking a sip of coke. My focus on looking after my right knee means I am concentrating on setting myself up for the ideal height step up or down with it. Each time I achieve the ideal step, I’m a bit proud of myself; it has become a game. After several hours I also realise that, if the angle is just right, I can walk/shuffle/jog gentle downhills without the aid of my poles. In fact, this is more comfortable and faster without poles. Curiously, in my addled brain, this method of locomotion is called Ben. I’m not joined by someone called Ben when I move like this, but Ben is what I think about. It’s a personified way of moving. I take another sip of coke and regain some clarity. We’ve gotta finish soon… things are getting weird. Determined to go as fast as I can in the final minutes before the finish, I start running again. It’s desperately painful and I let out a whimper occasionally, but the pain is acceptable because I can now see the lights of the town, the church and the finish below. The blissful ‘600m to go to the finish’ sign is passed, and I can now begin to believe that it is over. I’m desperate for it to end, desperate to just stop. 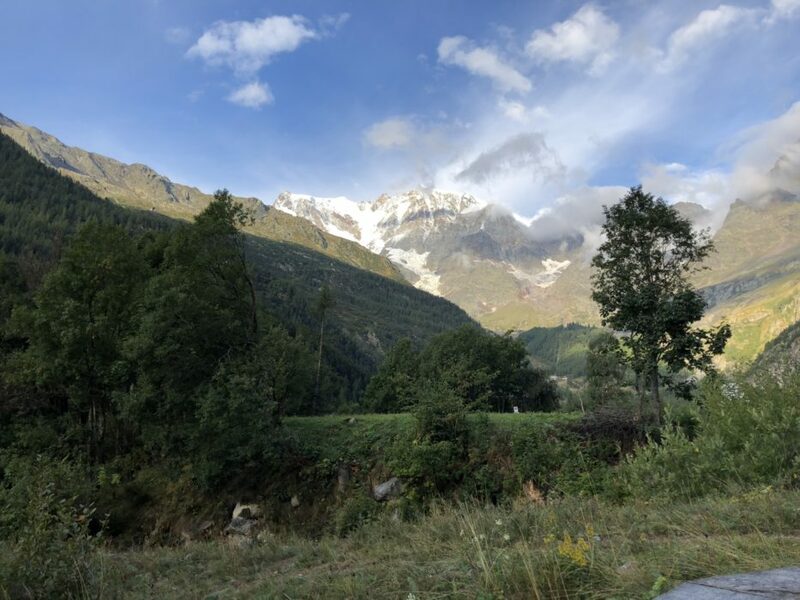 Finally, I see the finishing banner, and it all becomes clear: I have completed the circuit of the Monte Rosa massif, and I’m back where I started yesterday morning, nearly 41 hours ago. Everything is different and everything is the same. I have been everywhere and nowhere. Stepping over the Nepalese prayer flags that mark the finish line I cannot hold back the tears. Richard and Lizzy put my finisher’s scarf, medal and pen knife around my neck and congratulate me. Turning my head to my right I see Caroline, Maddy and my parents. The last seven hours have been more of a worry for them than for me. Caroline and Maddy drove 1000km and barely slept to look after me. Who knows, but without all of them I doubt I would have finished. After some minutes of sitting, Caroline helps me back to the chalet where pizza, a shower and a bed await. After a fitful sleep, I return to the finish line the next day to cheer in the final runners. Some run in, waving flags, shouting and screaming, ecstatic with their race. Others walk slowly over the line, a faraway look in their eyes, drained to their very core. 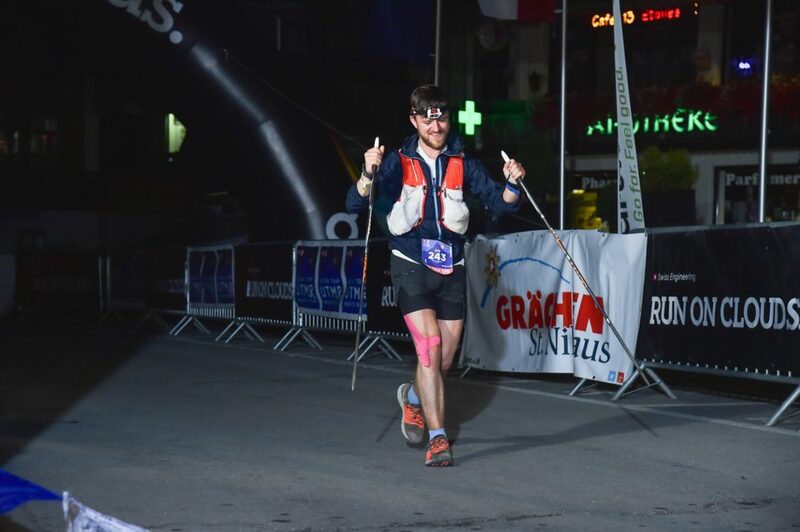 Sometimes a 100km race or 4-stage race runner crosses the line, running fluidly and looking fresh; a marked contrast to the 100-mile warriors returning from their long battles. Chatting with fellow runners who I’d shared some time with on the trails, we all remark that the Ultra Tour Monte Rosa is significantly harder than the UTMB in many ways. 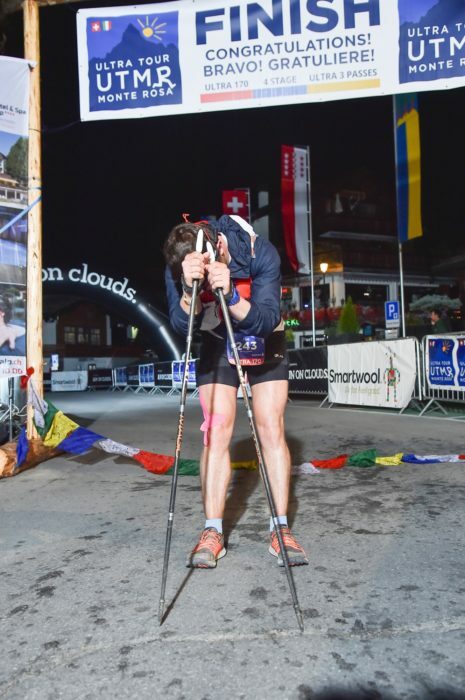 This race clearly deserves to get a reputation as one of the hardest mountain races in the world. 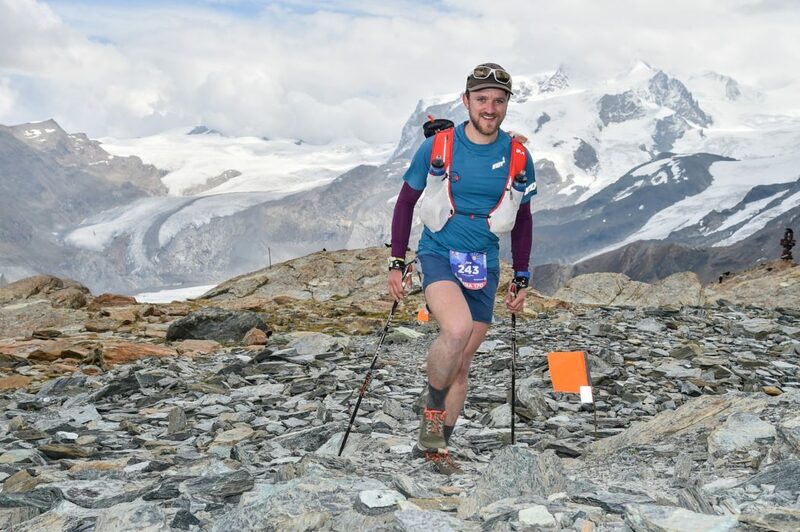 The UTMR race follows the route of the Tour of Monte Rosa, a classic nine day trek. Having run the race, I plan on returning some time to fastpack the route over a few more relaxed days, staying in the huts along the way. 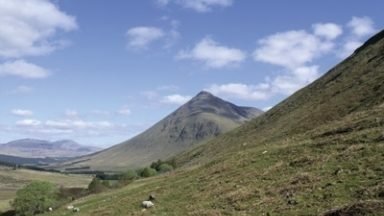 You've heard of the Corbetts but what exactly is a Corbett?